Karen is a former work colleague of mine who was celebrating her 50th birthday. Her order was for a cake to celebrate and for 30 matching cupcakes. For this one, I decided to make a deep, vanilla tray bake cake with a pair of flared ‘jeans’ which were cut from an 8″ square cake. The decoration was in the form of different coloured circles of fondant icing. The matching vanilla cupcakes had a white swirl of buttercream on top & were embellished with matching circles of fondant icing. Eva is the daughter of one of my children’s former junior school teachers. The original request was for a chocolate giant cupcake, but with the agreement of ‘mum’ she allowed me to play with an idea that I’d got in mind to upturn the base & decorate it as a giant mushroom. I am so pleased at how this cake turned out. I freestyled with the idea as I went along; simply knowing that I wanted the ‘roof’ to be red with white hearts instead of spots. I also wanted a ‘flying’ butterfly overhead. Mum tells me that Eva loved her cake, & her grandma tells me she loved it too! 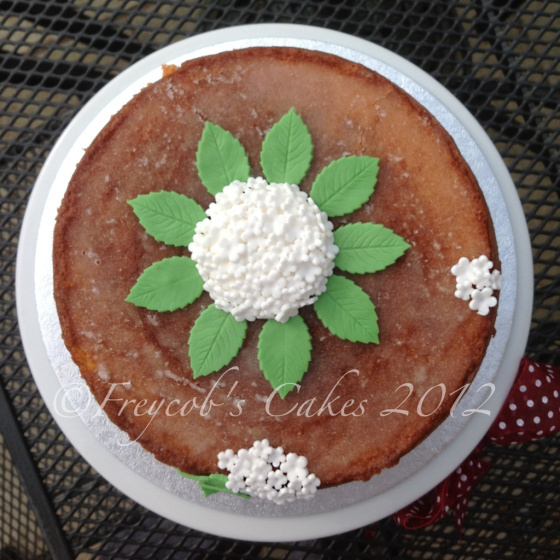 Another successful cake from the kitchen of Freycob. 1. Heat oven to 160C/140C fan/gas 3. 2. Grease and line an 8″ deep round tin with baking parchment. 3. Beat together the butter and sugar until light and fluffy. 4. Add the eggs, flour, almonds, baking powder, vanilla powder, elderflower cordial & milk and beat until smooth. 5. Pour into the tin and bake for 45-50 mins until a skewer poked in the centre comes out clean. 6. Just before the cake comes out of the oven, mix together the ‘drizzle’ cordial and sugar. 7. As soon as you remove the cake from the oven, leave it in the tin and prick it all over with a skewer. Slowly pour the ‘drizzle’ all over the cake, allowing it to soak in. 8. Leave the cake to cool completely in the tin, then carefully lift out onto a serving plate. 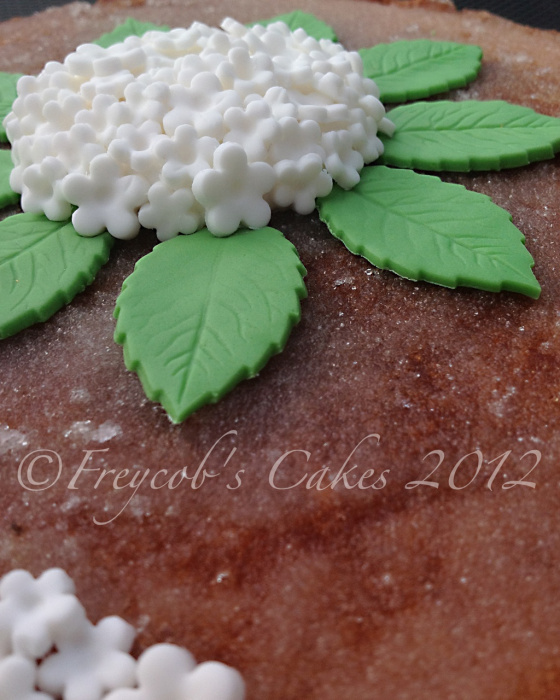 I chose to decorate mine with small, white fondant flowers cut & bunched to look like the head of an elderflower surrounded by some green leaves. Enjoy with a glass of cold, sparkling Belvoir Fruit Farms Elderflower cordial, or a lovely cup of tea. This is a lovely, delicately flavoured & moist cake that, due to the addition of ground almonds will easily keep for a few days. If you’re lucky and it doesn’t all get eaten very quickly that is! I threw a couple of batches of muffins together this evening. The beauty of muffins is in the speed of preparation for me. They can be whipped up and baking within 5 or so minutes. This recipe was adapted from one that was in an American community church recipe book that I received years ago, and which I’ve turned into muffins. 1. Preheat the oven to 190 Celsius / gas mark 5. 2. Line a muffin tin with 12 foil cases (foil cases keep the cakes more moist). 3. Sift together the flour, baking powder, bi-carb, salt, ginger & cinnamon. Stir in the sugar. 4. In a separate bowl/large jug, beat the egg then mix in the oil, black treacle, honey & milk. 5. Add the wet ingredients to the dry and stir to combine, making sure there are no pockets of flour left at the bottom of the bowl. Do not beat, but stop mixing when fully combined. 6. Immediately spoon the mixture (or pour into a jug and then pour it from there) into the cases. 7. Bake for 20-25 minutes until a cocktail stick comes out clean when inserted into the centre muffins. You can eat them plain, when still warm from the oven. Alternatively, why not mix some lemon juice / ginger syrup with some icing sugar and drizzle this over the top of the cakes? You can also add some chopped, crystallised ginger to the mix before baking.